Parts: 52 resin; I vacuform (plus 1 spare). Decals: ALPS-printed waterslide, markings for two ships. Molding Quality: 6 - crisp in places, soft in others. Some bubbles and voids, rough edges, lot of flash. Some parts molded (accidentally?) in very soft resin. Detail: 8 - about what you'd expect for a model this size. Cockpit poorly detailed. Overall Rating: 7 - Great subject but takes a fair amount of work to build into something respectable. Let's face it. It's not the 9' blue people that make Avatar, it's the hardware. 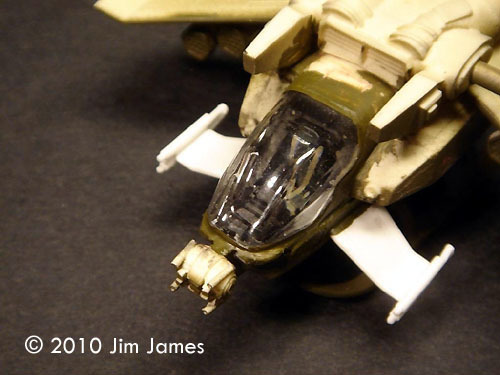 ^ The canopy frames are painted decal. 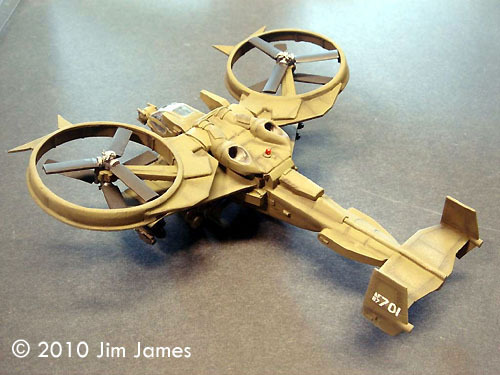 Fantastic Plastic's first Avatar kit is a 1/72nd scale AT-99 Scorpion Gunship - which is not to be confused with the more highly featured Samson that Trudi flew our heroes around in. 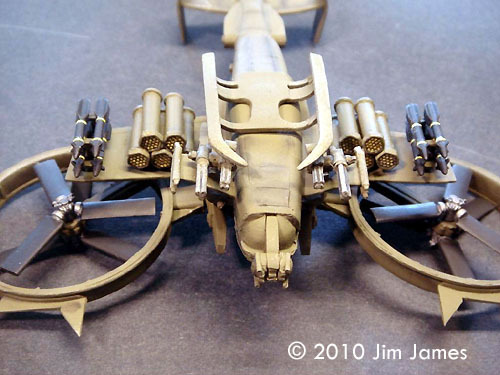 The Scorpion is the gunship used in the attacks on the Na'vi and Home Tree and differs from the Samson in that it's a single seater and heavily armed. You get 52 resin parts - some crisp, other a little soft. 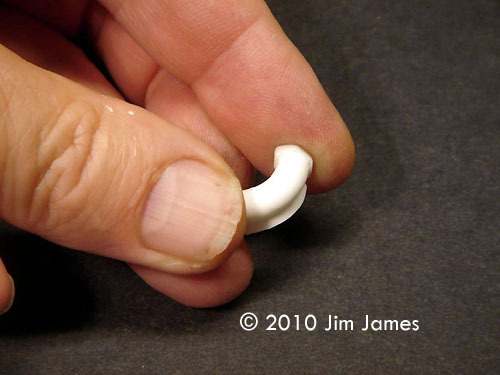 There were three types of resin used on my model - good quality white, lesser quality cream and some parts that were so soft that they would bend. Two of these parts were the main wings and, since I was afraid they'd droop with the weight of the under wing armament, I requested and received replacement parts. My copy was comparatively free of pinholes (but the few that did exist were in awkward places). There was a lot of flash but that was easy to remove. Some edges were pitted and needed putty and sanding. It's just hard to do crisp detail on this size kit but a valiant attempt has been made. I was particularly impressed by the guns and the rotors. Less impressed by the FFAR pods. Very unimpressed with the vacuuform canopy. The instruction sheet suggests an assembly sequence and shows you approximately where each part goes but there's a lack of detail and help where you might need to position a part accurately. A forward view of the main wings showing the arrangement of the FFAR pods would have been really useful. Reference materials are hard to come by. Obviously screen caps from the DVD help and if you check out the Official Avatar Wiki and go to Vehicles/Scorpion, there's a bunch of information including a link to a gallery of Scorpion photos at the very bottom of the Scorpion page. I replaced the pin and socket mounting for the rotors with a piece of brass rod drilled all the way through the top of the fuselage. I ground and drilled out the exhausts. They are a little shallow and no amount of black paint would have made them look hollow. I replaced the Hellfire missiles with ones from an Italieri AH-64 kit. Although the kit's missiles weren't bad, they were a little inconsistent. I was concerned that the Gunship would be tail heavy so I drilled out the cockpit floor and replaced it with lead weight - not quite enough, it seems. The cockpit is a little sparse so I dressed it up with parts from the AH-64 cockpit. There are actually only two cockpit parts supplied - the seat and a strange piece comprised of a cowling and a semi circle of flat resin (I think it's supposed to represent the clear HUD display). The latter looks out of place and doesn't fit well. There was an air bubble on the light on the top of the engine section so I drilled out the socket and replaced it with a piece of clear sprue painted clear red. Probably would have done that even if the lamp hadn't been damaged. 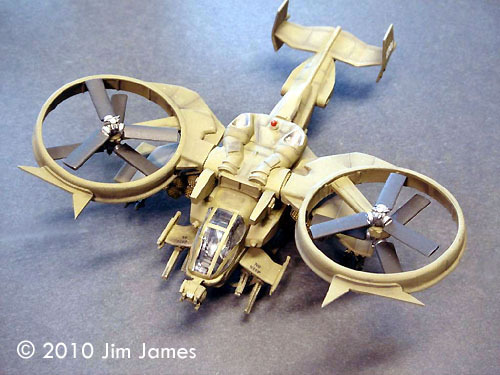 The weaponry on the Scorpion is what makes the craft distinctive. 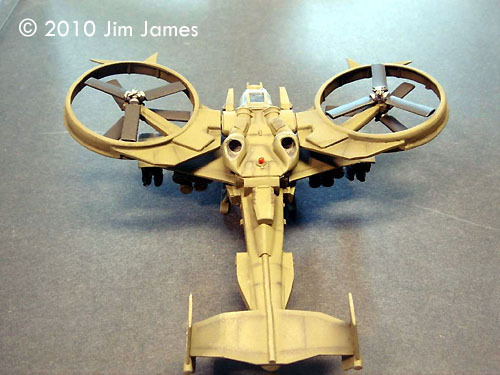 Some pieces like the Gatling guns under the forward winglets and the nose turret are really nice. 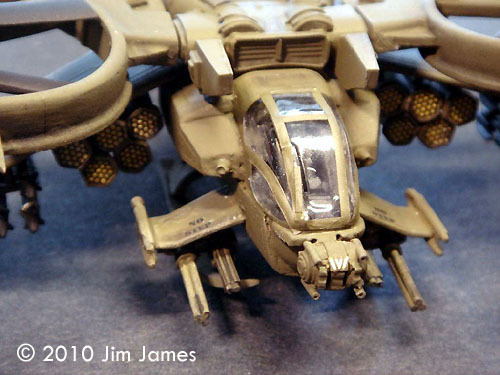 The Hellfire missiles and racks fall into the OK category and I replaced both the missiles and rack with AH-64 parts. The FFAR pods are OK but the pylon arrangement is confusing. The instructions call for the pods with long pylons to be glued to the wings. There are already short pylons molded into the wings and there's no indication if they are a guide or a base to glue the AGM pylon to. Either way, the FFAR pods would end up hanging too low. Lining up the pods is a nightmare. The first row of three is staggered and the second row of two is staggered so the front of those pods falls between the staggering of the bottom three. Lining the pods up with the stagger and making sure they a consistently spaced and parallel to each other is difficult. I ended up rebuilding the pods in styrene just to make gluing them together easier. I also made black decals to detail the front of each FFAR pod. This allowed me to paint the missile tip area with Zinc Chromate and mask off each missile and the inside of the tube front with the decal. The mounts for the Gatling guns on the front winglets need to be trimmed drastically to prevent the guns scraping on the ground (they default to the pointing down position). 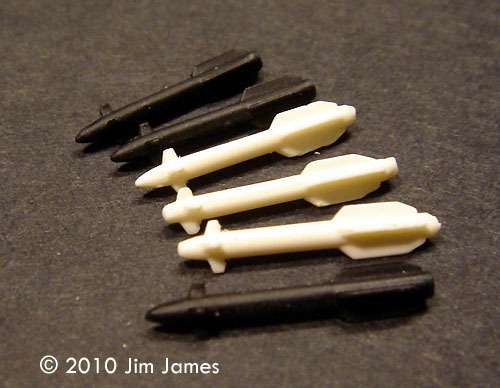 The kit comes with white tail numbers and alternate tail numbers just in case you want to build a fleet. I added two yellow stripes around each Hellfire, a black “No Step” on each of the smaller front winglets, the fronts to FFAR pods and some thin white lines to the nose gun. The one really weak part of this kit is the cockpit canopy. You get two clear vacuuform canopies but no resin plug. Cutting them out can be a hit or miss operation and, frankly, I can never seem to get the edges right. The frame detail is very soft and when compared to screen caps, the frames are about twice as wide as they should be. There is very little that can be done about it and because the frame edges are so soft, it makes masking difficult. 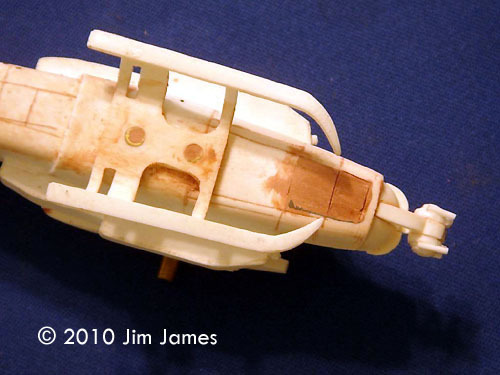 Given that fitting a vacuuform canopy is a less that joyful task, I detailed the cockpit and glued the canopy in place. After filling the seam between fuselage and canopy with white glue and Mr. Surfacer, I masked the whole canopy, painted the model and detailed the frame work with painted decal. What can I say; it's Olive Drab all over. 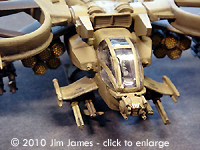 You can paint the Hellfires black and the rotors black with silver (steel) hubs. I used a fine sponge tipped brush (eye shadow applicator) and “painted” the panel lines a very dark green pastel mix. Using the sponge tip creates a dark center line with a bleed on either side. With all the under wing stores, it's best to paint the wing roots and first row of FFAR pods before adding the second row. I plan to use a simple base with floor modeled on a screen cap from the movie. In spite of the additional weight, the Gunship does not sit evenly on its skids (it looks tail heavy). I may add some ground clutter - tools kits, fueling pipes, electrical cables, etc. - and use one of those tubes (plugged in below the tail boom) to support the tail. It really is pretty nice model despite its challenges and because of its unique design and scale; it's a nice addition to my collection. Here's a short update from the manufacturer: We're aware of the "gummy" resin problem that affected several kits and have taken steps to correct this. All the new castings now in stock were created with a different resin mixture that makes all the pieces properly rigid and prevents sagging. 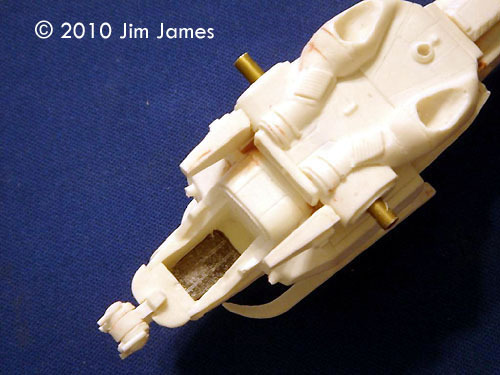 Any customers who purchased kits from the first batch who have problems can contact Fantastic Plastic directly and request replacement pieces as needed. This page copyright © 2010 Starship Modeler. First posted on 1 September 2010.